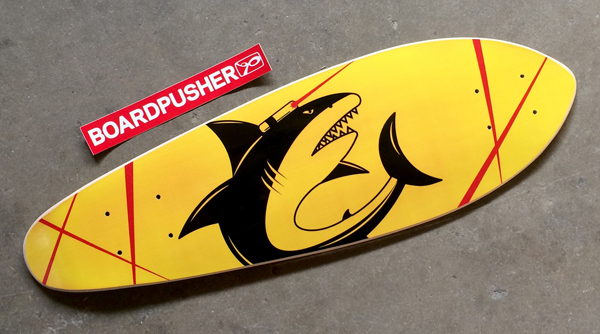 Keller Mochel took inspiration from the California state flag for today’s BoardPusher.com Featured Deck. We like the geometric/prism style used to accentuate and keep this golden bear mini-cruiser fresh. You can see more of Keller’s work at kellwmochel.wixsite.com/keller-mochel-design or follow him on Instagram @kellmochel. Check out the BoardPusher.com mini-cruiser in action here and then design your own custom mini-cruiser graphic here. 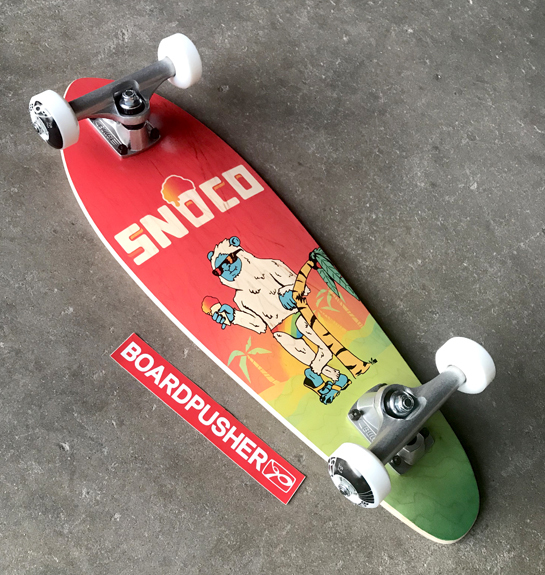 We are merely just disciples of today’s BoardPusher.com Featured Deck. 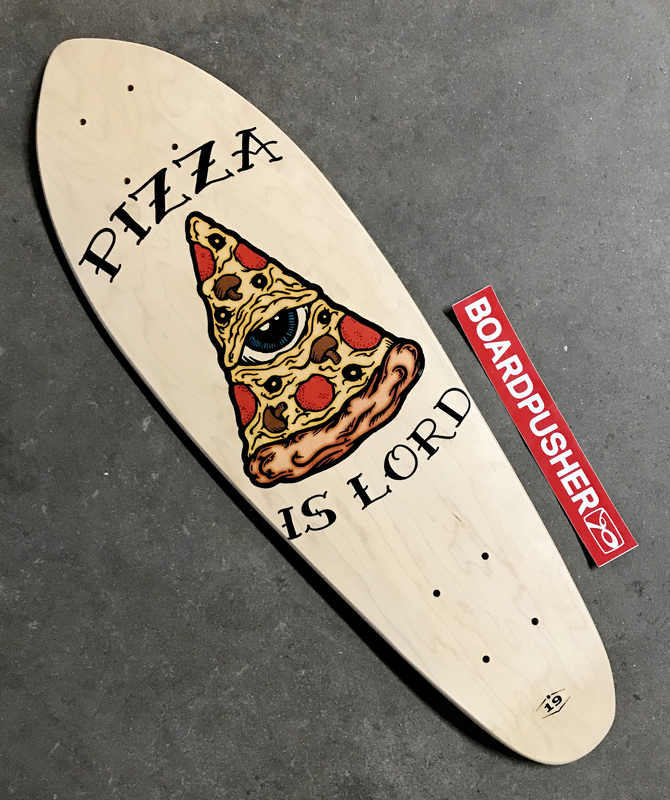 “Pizza Is Lord” is a mini-cruiser graphic designed with a natural background by the Minneapolis art collective Squad19. You can find more of their skateboard graphics available at BoardPusher.com/shop/Squad19. Create skateboard designs with your friends and skate crew at BoardPusher.com. L.A. based illustrator Wesley Ching used his skills to create a custom graphic for our mini-cruiser shape and it’s today’s BoardPusher.com Featured Deck. You can check out Wesley’s portfolio at wesleyching.com or follow him on Instagram @wessching. Design your own custom skateboard graphic on a mini-cruiser while supplies last at BoardPusher.com. 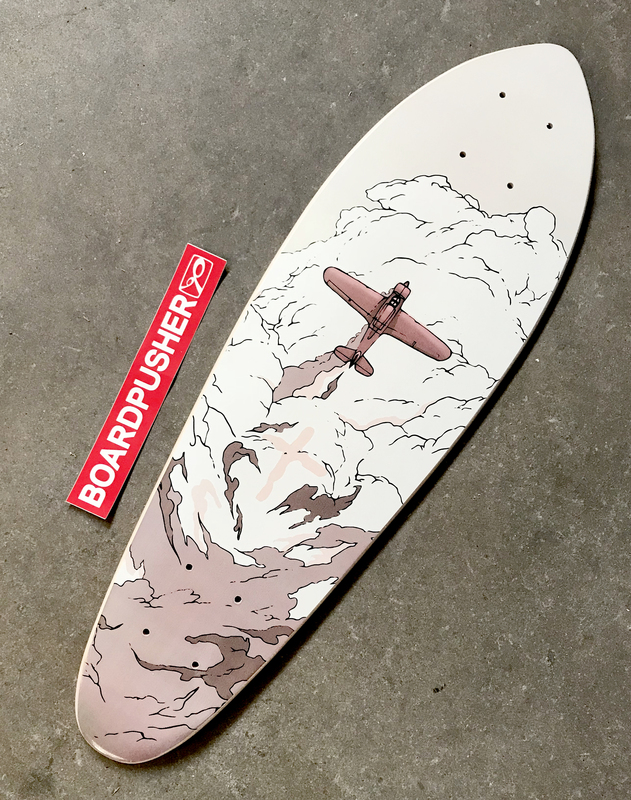 For this week’s BoardPusher.com Featured Deck we have a mini-cruiser designed by Geri Massengale. “This ‘Shark with Frickin’ Laser Beams’ skateboard is a gift to our Senior Talent Sourcing Manager. Our unofficial team mascot is the shark with laser beams and because he loves cruising we thought this would be perfect for him. I remade this using Illustrator, implementing Microsoft colors.” Check out Geri’s personal blog at craft-comfort.com. 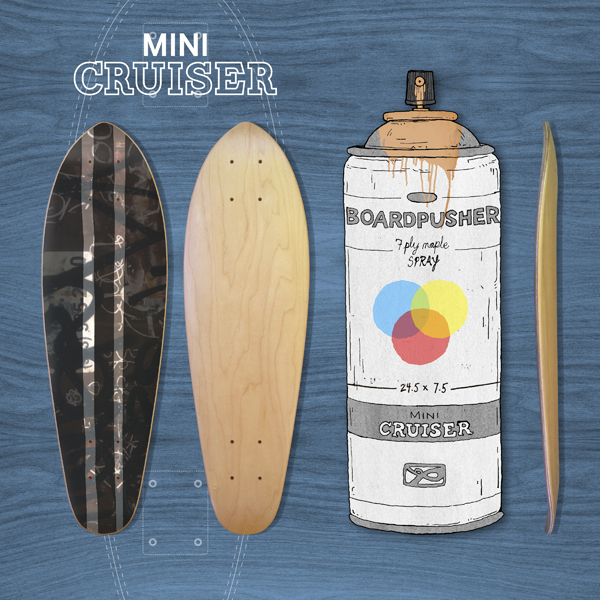 Design your own mini-cruiser at BoardPusher.com. 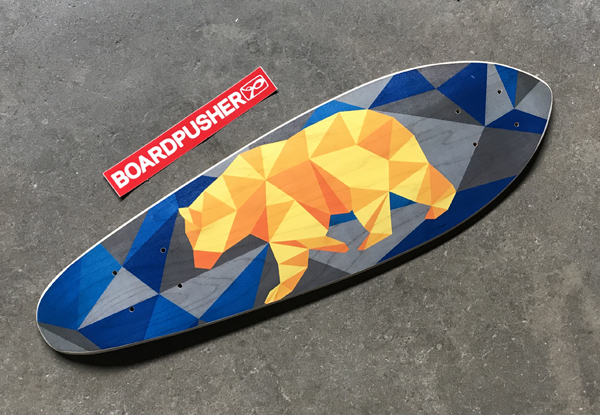 Create a one of a kind graphic for the BoardPusher.com mini-cruiser shape. This deck is perfect whether you’re cruising down the sidewalk or ripping through ditches. Also portable, it’s easy to stash away when you get to your destination. Try designing one with your own custom graphic here. Make it a complete and slap some 60 or 65s on it to avoid those pesky cracks.